California's vast 49th Congressional District stretches along the coast of southern Orange and northern San Diego counties — and now it's a key battleground in the fight for control of the House of Representatives. Not that long ago, this was a safe GOP seat. But for several reasons, it's not anymore. First, the district’s population is less white and more Latino than it used to be. Additionally, fewer voters there are registering as Republicans. Finally, the electorate was growing increasingly dissatisfied with Republican congressman Darrell Issa (R-Vista), who won his 2016 re-election by just over 1,600 votes, beating a relatively unknown Democrat with many fewer resources. In January, perhaps realizing he couldn't turn back the rising tide of dissatisfaction, Issa announced he would not seek another term. UC San Diego political science professor Thad Kousser said the unexpectedly close election in 2016 energized Issa's opponents. "After his narrow re-election, a huge amount of activist energy led to a major voter registration drive in the district that accelerated the impact of demographic shifts on the makeup of the electorate," Kousser said. He said that Issa's retirement, combined with massive Democratic spending in the 2018 cycle, have turned this into a "leaning-Democratic district." 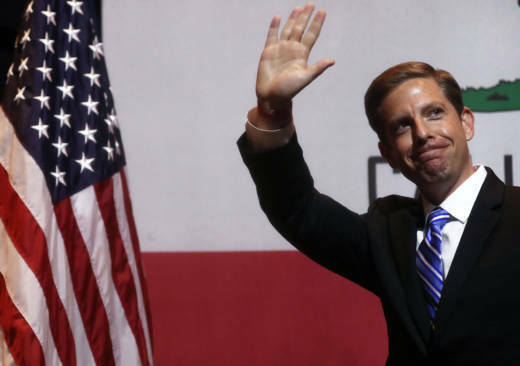 And heading into the final stretch before the election, polls show that Democrat Mike Levin seems to have the upper hand against his Republican opponent. Levin, an environmental attorney, is making climate change a central part of his campaign. Levin may be tapping into something coastal residents care about in a district where the now-closed San Onofre Nuclear Power Plant is located. Levin has raised over $4 million and seems to have the wind at his back. Driving north on Interstate 5 at rush hour, it's not uncommon to see campaign volunteers gathered on overpasses, holding large "Levin for Congress" banners and waving to commuters. UC Irvine political science professor Graeme Boushey said there’s strong support for progressive-tilting positions in California on issues like health care, immigration reform and gun control. He said that puts Republicans candidates in swing districts like the 49th in a tough spot. Republican Diane Harkey, Levin's opponent, is endorsed by President Trump. She was asked to run for the seat by congressman Issa, and was reluctant at first. "When he first called me, I told him he was nuts," she said. "I said absolutely not. I'm not going to be the one that runs in the flipped 49th." But after thinking it over, Harkey decided to jump in. The former state assemblywoman said California is hurting itself by resisting so many of Trump’s policies. Bakersfield Republican Kevin McCarthy — the House majority leader — helped push the tax bill through, and all but two of the 14 Republican members of Congress from California voted for it. But Harkey argued a vote for her means California would have even more of a say on federal policies affecting the state. She’s hoping that message keeps her head above water in what Democrats are hoping is a large blue wave.